IELTS is an extract of The International English Language Testing System. It is a form of test by which the language ability is determined of the aspirants who aim to study or work where English is a language communication and instruction. The British Council, IDP Australia and Cambridge ESOL are joint ventures who assess this test. Students who aspire to study abroad or choose to immigrate appear for the test. 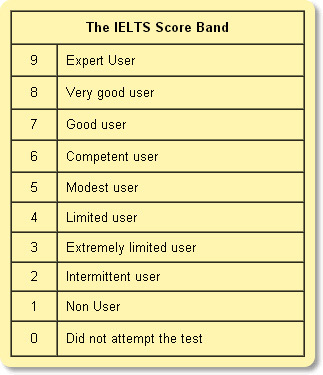 IELTS compute a candidate on a band scale of 1 to 9. The minimum score accepted for a course ranges from 5.0 to 7.5, depending upon the courses and the institutes you are applying to. The most common acceptable requirement is a band score of 6 to 6.5. The Test Reports are valid for a period of two years. Academic Module: For aspirants seeking entry to a University or institution of higher education offering degree and diploma courses. General Training Module: For students seeking entry to a secondary school, to vocational training courses or for people taking IELTS for immigration purposes. In the UK, Australia, New Zealand and Canada, IELTS is a mandatory exam for admission into universities and training programs. IELTS is not accepted by many US universities in which case you need Test of English as Foreign Language (TOEFL) to study there. The tests are administered at centers throughout the world. There is no such limit for a student to appear for the test but generally students appear 2-3 times to the maximum extend as it fulfills the required scoring with these attempts made.